Just like optical fibers, waveguides on chips have the advantage of being able to support data signals at different wavelengths. While an electrical wire has a set voltage and carries a single signal, optical waveguides can support many signals on top of each other, often with little interference between them. But sometimes you want to filter out one of the wavelengths and leave the others on their way. This can be done with a ring resonator. 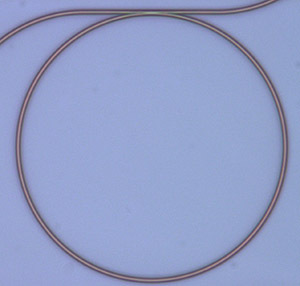 A microscope image of a ring resonator on a chip. They are usually on the order of 10 microns in radius. When two waveguides are placed near each other, but not touching, light from one couples into the other. This is somewhat analogous to quantum tunneling. 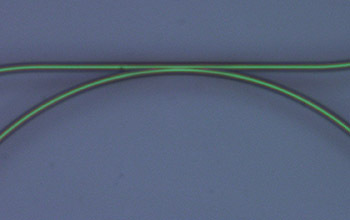 In a ring resonator, a waveguide is bent into a circular loop and placed alongside a straight waveguide. At the location where the straight waveguide comes close to the ring, the light couples from one to the other. But over reasonable time scales, the light has a chance to go around the ring and reach the coupling region again, so it has the chance to couple back to the straight waveguide. So there is an interference effect between the waves of light on the waveguide with the light from the ring. A close view of the coupling region between the ring and the waveguide. The two waveguides don’t actually touch. The main feature of the ring is its circumference. If the path light travels on the ring corresponds to a set fraction of multiple wavelengths, then the light at that wavelength from the ring interferes with light on the straight waveguide destructively. That one wavelength, which was present before reaching the ring, is no longer propagating on the waveguide. But other wavelengths don’t divide into the circumference the same way, and so they don’t see the same destructive interference. They go through. The net result is that the ring filtered out a single wavelength and allowed the others through. This filtering can be extremely sharply defined, so even if one wavelength channel is at 1550 nm and the other is at 1550.1 nm, it’s possible to filter one and not the other. This entry was posted in Education, Research and tagged CIAN Students, Cornell, fiber optics, optics, photonics, research. Bookmark the permalink.